the art world is quickly becoming more tech savvy. 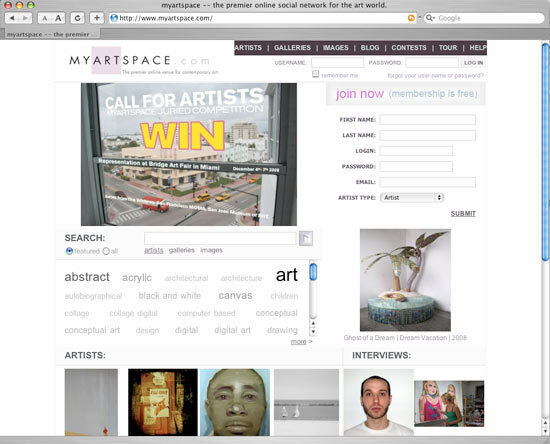 myartspace is a perfect example, the site is an online community of more than 40,000 artists, collectors, students, curators, critics and art appreciators. the site serves primarily as an online gallery for established and emerging artists, letting them show their work without restrictions and share it across the web. the site allows artists to embed these galleries on other sites such as blogs or other social networks. the site also boasts a large collection of artist interviews that numbers at around 500. myartspace also holds competitions with prestigious jurors and just launched a competition involving the bridge art fair in miami. the top three competition entries will show their work at the bridge art fair during art basel miami running from december 4th to 7th.